We often think that the book of Esther has one heroine, the queen herself, or perhaps two if we include her relative Mordechai who pushed her to act. But the difficult truth—the one we don’t like to admit—is that if we examine the book more closely we learn that it is the Jews of Persia themselves who went out rioting in the streets, with the permission of the king. The Jews massacred 75,000 individuals the Biblical text tells us (Esther 9:16), while not stealing any plunder. This is an oddity of Jewish history, that Jews, with full permission and ratification of the ruling power, were able to go out and defeat their enemies, a rarity in Jewish history, yet one that has taken hold (see Bar Ilan University historian Elliot Horowitz’ book Reckless Rites for more on this). Trying to get behind the difficult and profoundly uncomfortable morality of this aspect of the story undoes many of our assumptions of understanding ourselves as that Jews who are commanded and understood to be “rachmanim benei rachmanim” merciful people children of merciful people. This account of the Jews of Persia out on a killing spree is a text— along with the Levites’ killing of three thousand men after the Golden Calf was erected (Exodus 32: 28), or the deaths of many Egyptian first born in the plagues, or of the men of Shechem at the hands of Shimon and Levi (Genesis 34), or the story of Pinchas, killing others in his zealotry for the Lord (Numbers 25:7-10)—that is hard to understand. How could a merciful or fair God allow so many, some of whom are presumably innocent and were not afforded any kind of due process in a trial, to die? What is so profound about the Bible is its refusal to shy away from difficult questions or to give easy answers. I do not think we have any right to go around dispensing vigilante justice, now or at any time. I do think there is something powerful in realizing that the triumph of the Jews of Persia was not due to one queen and her advisor, but to actions of the group. “The Jews gathered themselves together in their cities and in all the provinces of the king Ahasuerus,” Esther 9:2 tells us. This gathering ultimately is what made the difference for the people in their success at overcoming Haman’s threat to them and his plot to harm them. They did not rely on Esther alone, assuming that her influence would enable them to remain safe. There are American Jews today who think the intercessions of those in the palace alone will make a difference. However a reading of the book of Esther through to the end shows that it is ultimately the actions of the group rather than the influences of the queen, that enable the Jews to resist. The Jews of Persia gathered and they acted. While I believe that in today’s world, gatherings should be peaceful and non-violent, they must occur. 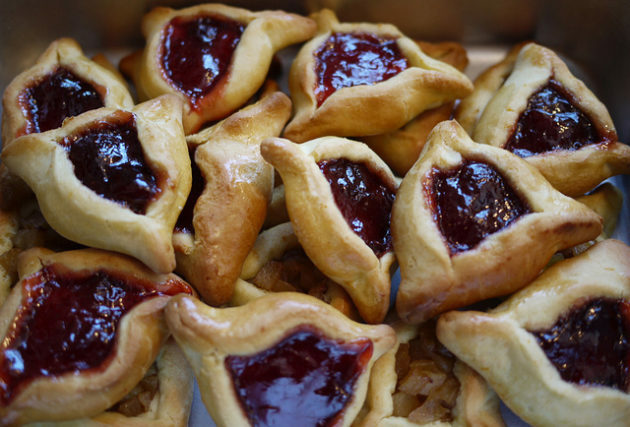 As the product of human activity, Purim is held to be a holiday that will continue beyond historical time, into the time of the Messiah. Why? Humans were act properly without the need for divine guidance; God is never mentioned explicitly in the book of Esther, the Bible’s only book with this feature. Maimonides in Hilkhot Megillah 2:18, quotes Esther 9:28 about the endurance of the holiday in every generation, even beyond historical time. Even when the Messiah comes we are told, and no action is needed on our part, Jews will remember this one holiday. I would suggest that this values the fact that even without divine intervention, sometimes we humans are capable of making good decisions, in order to put power in the hands of those who will use it well. There is a threefold strategy to be learned from Esther. Listen and be vigilant, at the king’s gate and elsewhere, about what is going on in the precincts of the palace and where power is contained. Be willing to risk everything as Esther did in chapter 4:16 – lives are at stake if a tyrant is not stopped. Send letters as Mordechai and Esther do in chapters 9 and 10, commit things to writing as an effective means of both protest and of establishing a new order. Human action and vigilance will save the day, I am hopeful. The morning after the election, my husband said to me, “I feel like I am Mordechai in the book of Esther” and explained that the first thing Mordechai did was to be vigilant, to sit at the king’s gate and see what was going on (Esther 2: 19,21). He added that by sitting at the gate and observing, we have a chance to see wrongful activity and intervene. Sitting at the gate, Mordechai overheard some terrorists plotting to assassinate the king, told Queen Esther (significantly, here in 2:22 is the first use of her title) and she informed the king who investigated and thwarted the attempt on his life. Like Esther and Mordechai, Jews need to use the playbook of the book of Esther to observe our world, as well as to write down facts and send letters and act as a group to consolidate the power we have. We can’t leave matters in the hands of others, but need to gather together in order to create a just society where the values of Esther and Mordechai rather than of Ahasuerus and Haman are in ascendance. Beth Kissileff is the author of the novel Questioning Return and editor of the anthology Reading Genesis. She has taught Bible and English literature and has a PhD in comparative literature; visit her on line at www.bethkissileff.com.